What type of diamond is right for you — round, princess, emerald? Most people have an option or two in mind when they start searching. But there's a lot to know about the way diamonds are cut and how to choose a great diamond in every shape. So we put together this article to arm you with a bit more information on what you’re looking for as well as some broader context for the options available. Do shape and cut mean the same thing? Diamond Shape and Diamond Cut refer to related but different aspects of a diamond’s appearance. Diamond Shape is the two-dimensional appearance of a diamond — round, square, oval, etc. 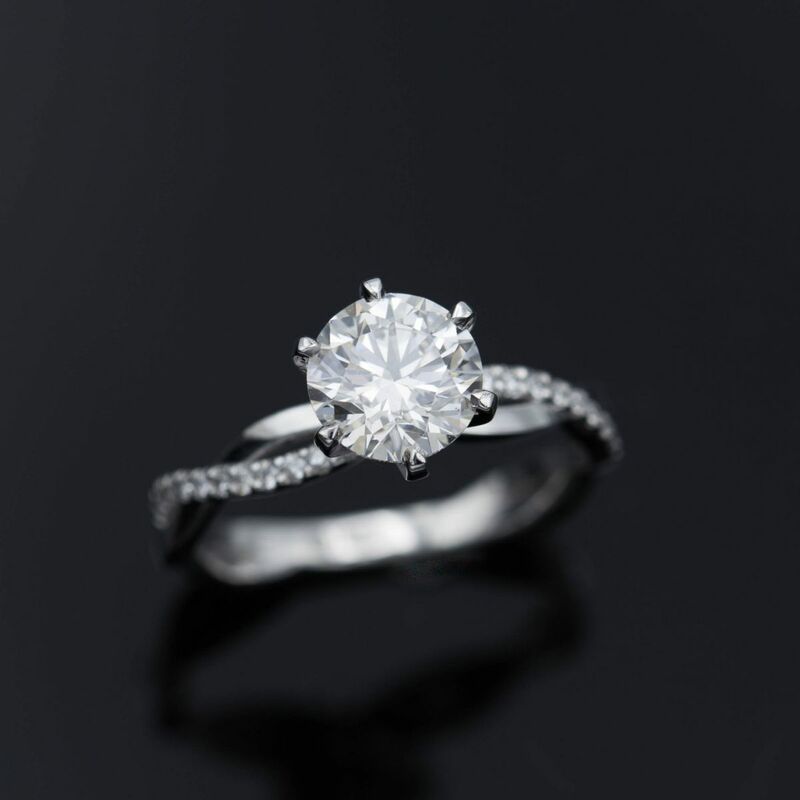 Diamond cut refers to the detailed three-dimensional proportions that determine how light is reflected by the stone. For example, square shape diamonds come in a number of popular cuts, including princess and cushion. Both are squares, but as you can see below, they have a different faceting structure and thus different appearance. Together, shape and cut tell you what type of diamond you’re buying. The most popular type of diamond is formally referred to as a round brilliant cut. Shape and cut start to get confused because, many diamond types are referred to by either only their shape (e.g. round, oval) or by only their cut type (e.g. princess cut, emerald cut). The corresponding shape or cut is implied based on what’s most common for that type. It’s implied that round refers to round brilliant cut and oval refers to oval brilliant cut, unless explicitly stated otherwise. In some cases, the specific cut name also covers shape. For example, asscher cuts are always squares. All of these overlaps between the use of shape and cut explain why the two terms are sometimes used interchangeably. Cut type is different from cut grade, which is one of the 4Cs (Cut, Color, Clarity, Carat) used for assessing a diamond’s quality. More on the 4Cs. Brilliant cut diamonds are designed to maximize brilliance, fire, and scintillation. In fact, their extensive faceting is scientifically engineered to increase light return. Brilliant cuts are closely associated with sparkle and are by far the most popular cutting style. More than 90% of diamond center stones are some form of brilliant cut. In contrast to the scintillating sparkle of brilliant cuts, step cuts produce fewer, larger gleams of light. They can be said to flash on and off as they move, producing a sophisticated, elegant look. Their structure consists of four-sided facets that go up and down each side of the diamond in steps. These large facets are flattering for exceptionally clear and colorless diamonds. Emerald cut, baguettes, and asscher cuts are the most well-known step cut diamonds. Rose cuts’ vintage style dates all the way back to the 16th century. They feature a flat (or close to flat) bottom and a domed top with triangular facets. They are primarily rounds, but also seen in oval or elongated shapes. 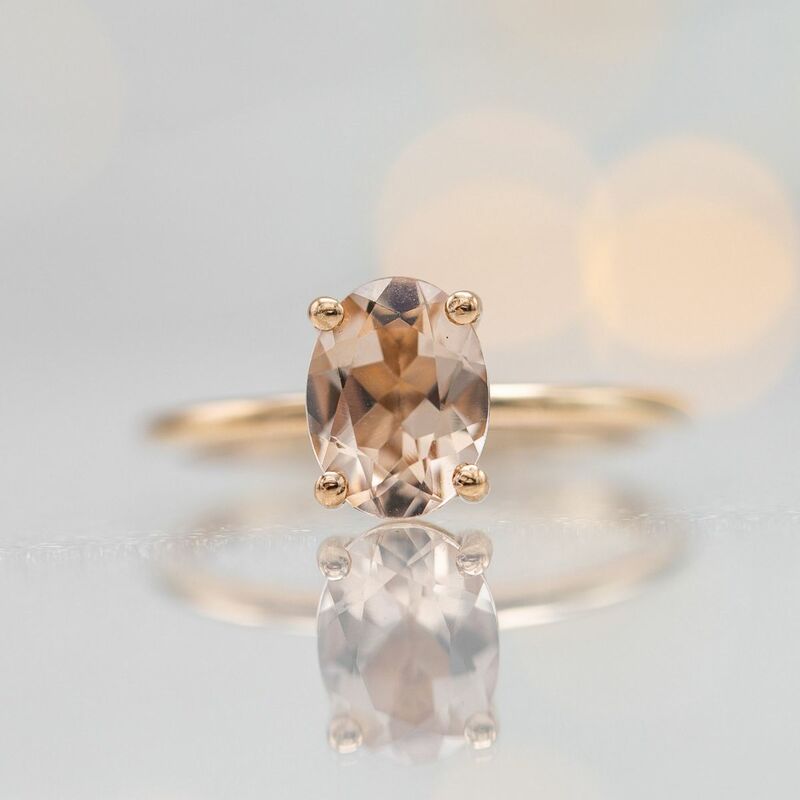 Rose cuts fell out of favor after the development of the brilliant cut, which returns much more light and sparkle. Today rose cuts hold a unique and classy vintage appeal. Cabochons have flat bottoms and smooth polished domes. 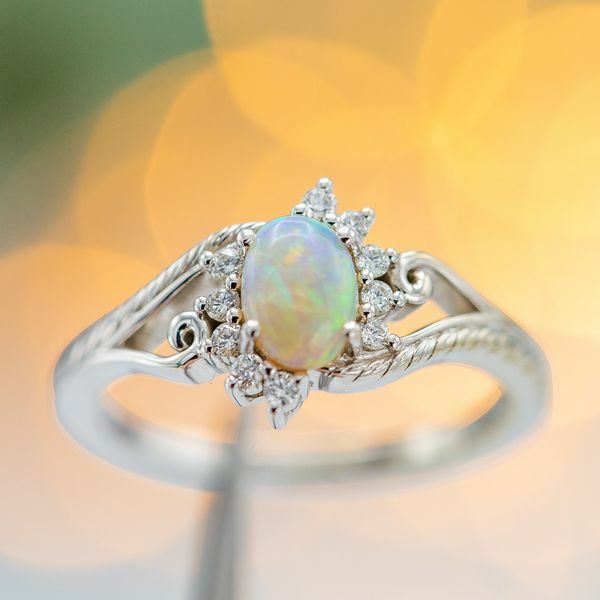 While very rare in diamonds, cabochons are common in opaque or semi-transparent gems such as opal, moonstone, and turquoise. Round brilliant cuts are designed to maximize a diamond’s “sparkle”. No other shape will display the unparalleled brightness, fire, and scintillation that makes them by far the most sought-after diamond shape on the market. Round brilliant cut diamonds deliver unparalleled light return and a mesmerizing look the whole world loves. Combine this with the stylistic versatility to fit nearly any setting style and it’s no wonder more than half of engagement rings sold today feature a round center stone. Don’t be afraid to drop down a couple of color or clarity grades on your certificate and keep the money or put that money toward a larger stone. The strength of light return in a round hides minor blemishes and color imperfections from the naked eye. You can find a colorless diamond with J+ color and eye clean options with carefully selected SI clarity. This square shape is also a type of brilliant cut, with incredible sparkle and brilliance. It’s a highly efficient cut, meaning that it results in a low loss of material when fashioned from diamond rough. This efficiency leads to it often being cut from the best quality material. 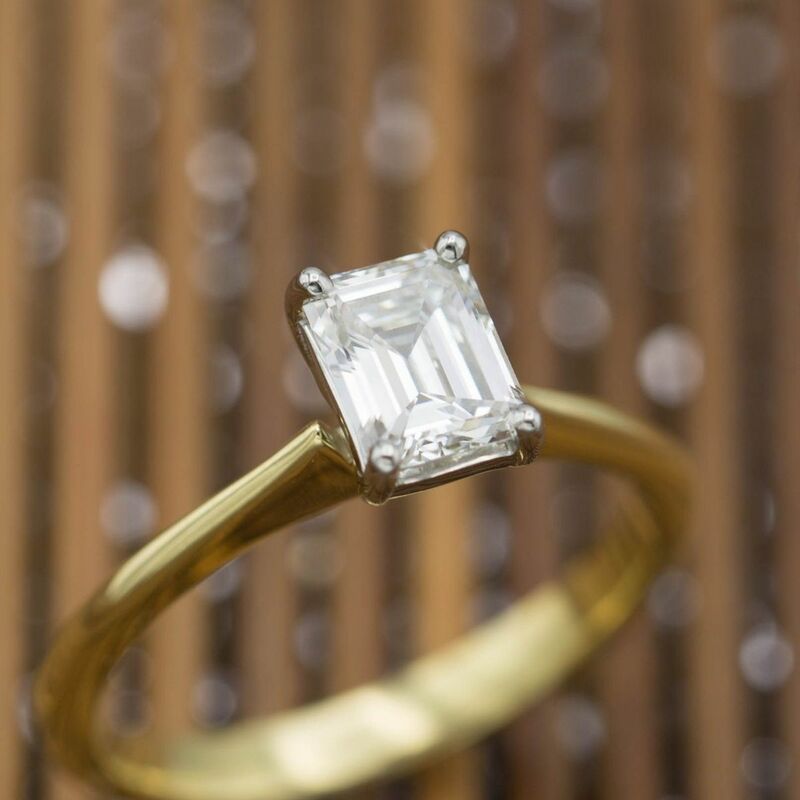 The princess cut delivers a versatile square shape with nearly the same brilliance and light return as a round. You can also afford more stone for your money, since princess is such an efficient cut. 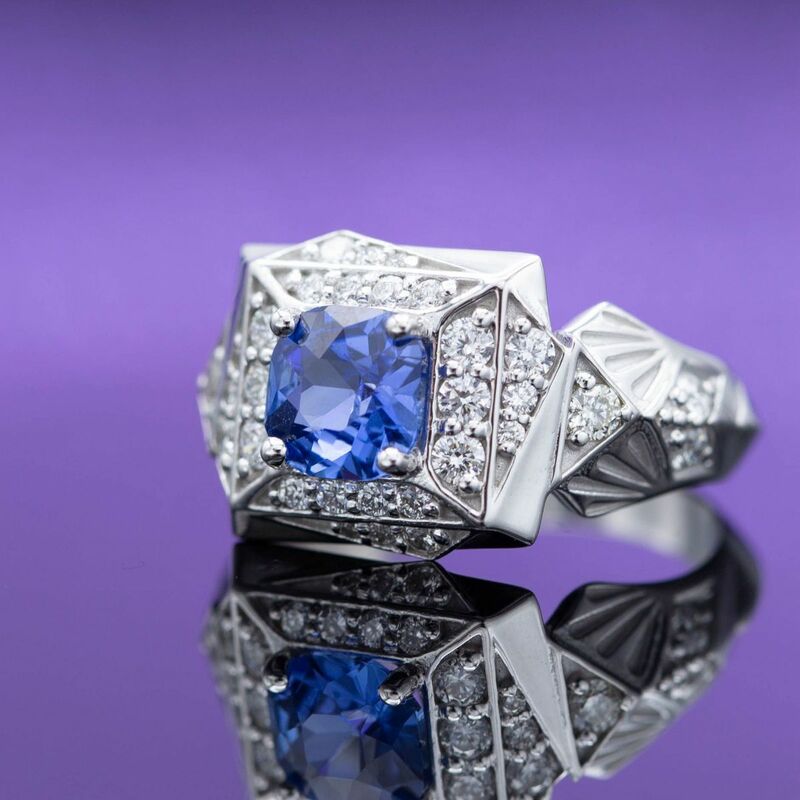 This combination of style, size, and brilliance makes princess cuts a popular choice. Look for a length-to-width ratio close to 1.0 to make sure your diamond looks perfectly square to your eye. For a colorless appearance, stick to I color or better. Eye clean options are available in SI clarity and above. More depth tends to improve brilliance at the expense of face-up size. We recommend between 65% and 75%, with a preference for lower depths. The oval brilliant cut is a stretched version of the round brilliant cut with longer sides. It has surged in popularity in recent years and over the past 12 months has been one of our most popular shapes. 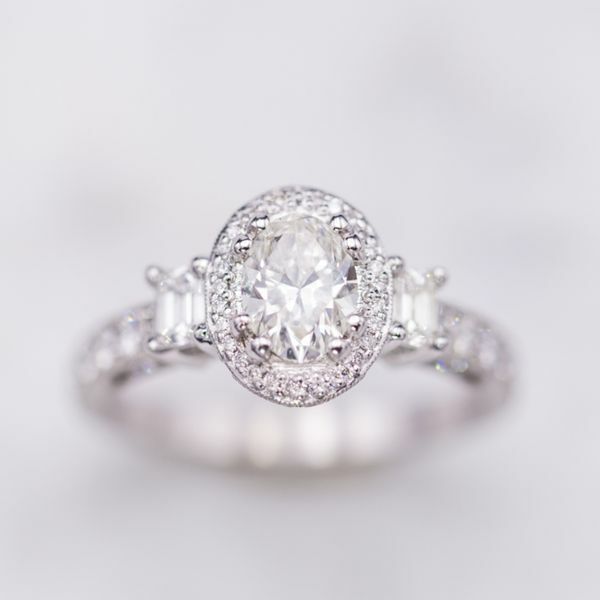 Ovals add a unique twist onto the classic look of a round. Their extended shape faces up larger than a round of similar carat weight and gives the wearer’s finger an elongated, flattering look. Pay close attention to the face-up shape appeal of the stone. You want smoothly rounded curves and a length-to-width ratio between 1.3 and 1.5. Work with an expert and inspect the stone in 360 video to ensure proper proportions and avoid an extreme bowtie effect. We recommend H+ color to avoid any visible tinge. Oval’s brilliance hides imperfections well, so eye clean options are available starting at SI clarity. Its vintage squared shape and rounded corners make for a gorgeous combination. Some customers prefer a scintillating "crushed ice" style, while others favor an “antique” or “chunky” faceting pattern. Through the 18th and 19th centuries, a vintage version of the cushion was the most popular diamond cutting style. The soft edges of today’s cushion cut diamonds evoke that earlier era. Flexible, cushions fit with a range of settings and look good with or without a halo. They are a great choice for customers looking for a square or rectangle with a softened feel. Also, these high yield cuts come at a discount relative to diamonds of similar carat weight in other shapes. Cushion cuts vary more broadly in style than other shapes. Some are quite rounded and nearly circular, while others are nearly square. They vary in length-to-width ratio from square to rectangular. Step one is finding a shape and style that look good to your eye. From there, you want to make sure that depth and table percentages are under 70% and verify other features of cut. Cushions hide inclusions well, so you can find eye clean SI options. By contrast, they show color tint as much any other style, so you want to be careful to stick to H+ to maintain a colorless appearance. 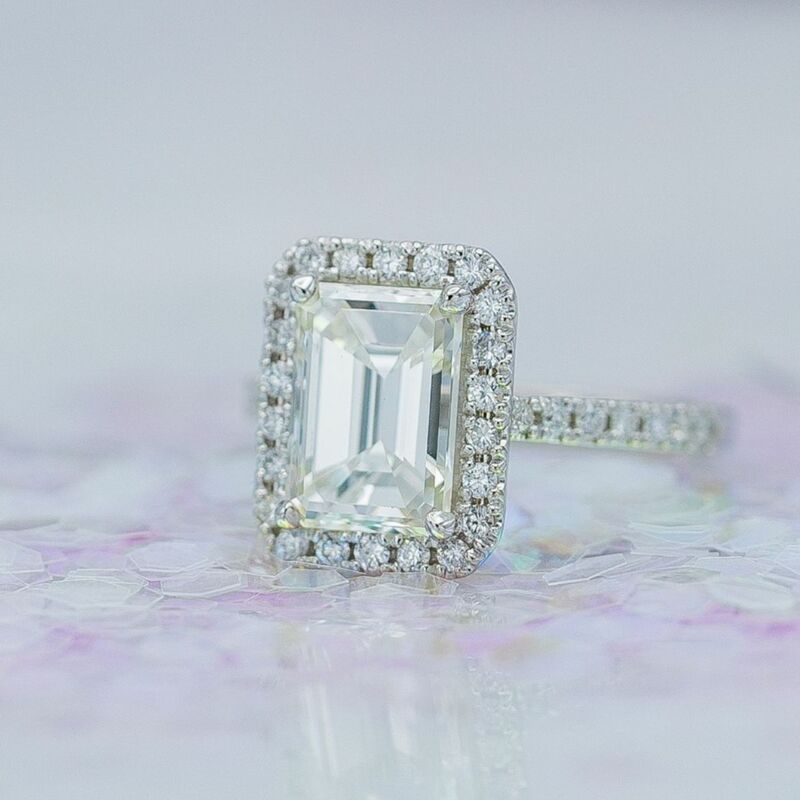 Known for their elegance and symmetry, emerald cut diamonds are a classy choice. Step cut faceting means they create a hall of mirrors effect that is subtler than the sparkle of brilliant cuts like round and princess. 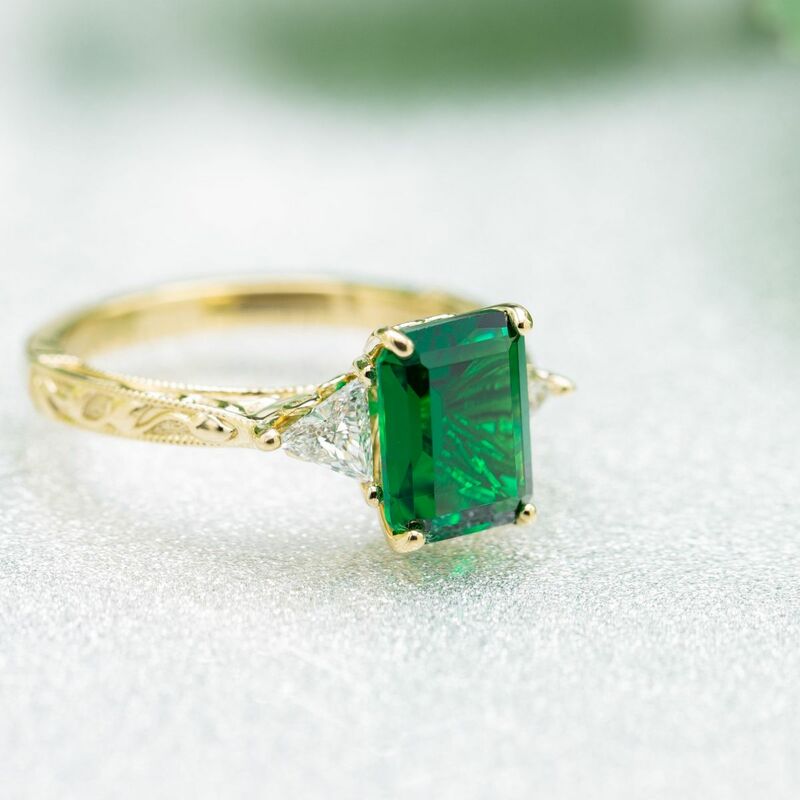 The cut style was originally developed for emeralds to match the elongated crystal structure of emerald rough, hence the name. Emerald cuts, with their clean geometrical lines, first gained popularity in art deco design but can fit a range of styles. Large facets produce dramatic flashes of light and shades of dark. As an added bonus, the proportions of emerald cuts mean that they appear bigger than diamonds of a similar carat weight in other shapes. Emerald cuts have a large open table and clean rectangular geometry, making inclusions highly noticeable. To get an eye clean stone, we recommend finding a quality VS option. Subtler sparkle (which makes color more noticeable) and less color pooling balance the visibility of color relative to brilliant cuts. We recommend I color or better to ensure your diamond looks colorless to the naked eye. An Asscher cut is a square step cut with cropped corners. Royal Asscher is a branded term that refers only to stones produced by the Asscher family that invented the cut. 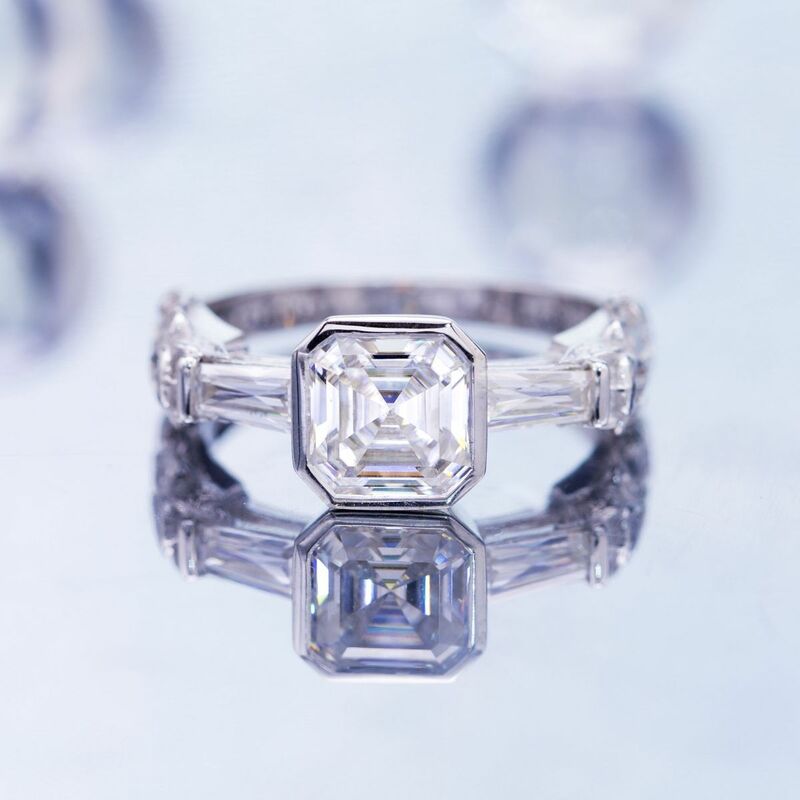 Similar to brand names that come to define products, like Kleenex and ChapStick, the term Asscher is used broadly to refer to square emerald cut diamonds. 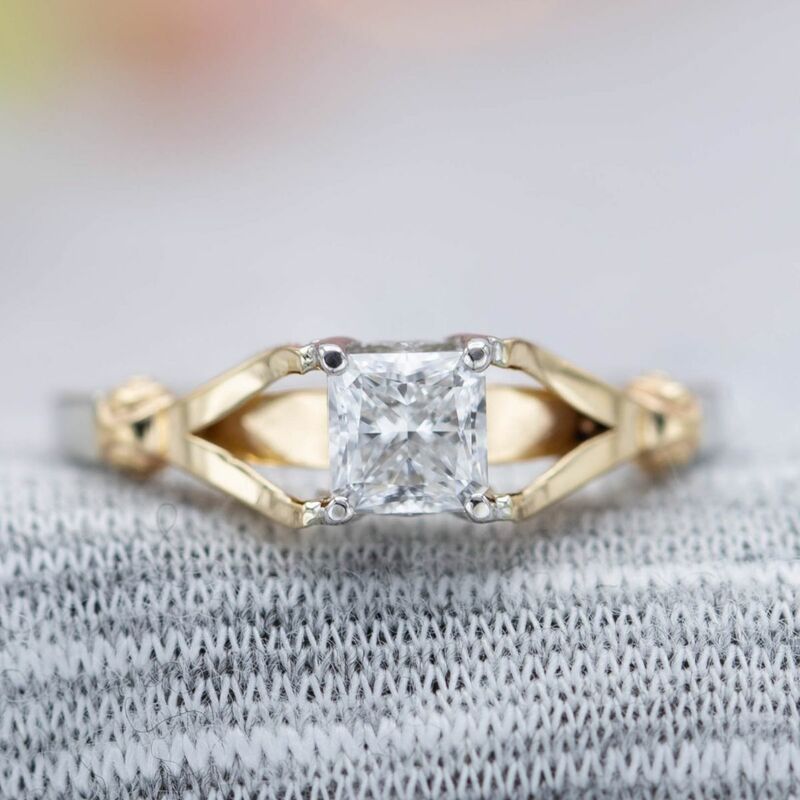 There are a number of variants on the design in terms of proportions and number of facets, but all can be properly referred to as either asscher cuts or square emerald cuts. The mesmerizing geometry of an asscher’s concentric squares produces a classy understated look. Movements produce the distinct flashes of light and dark that are the signature of step cut diamonds. 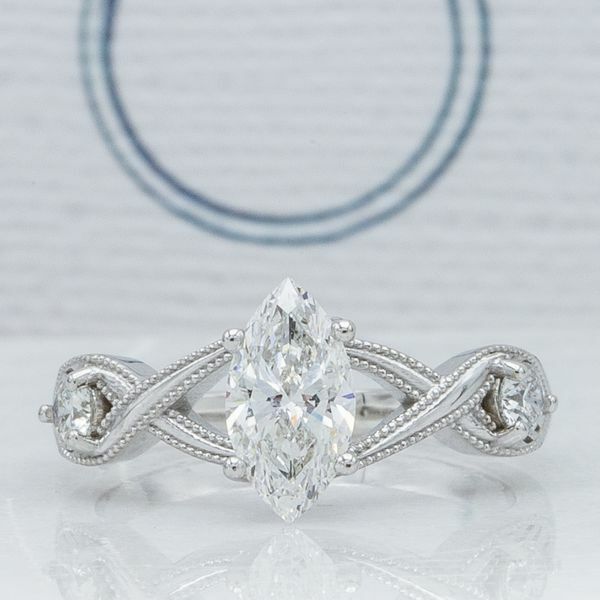 Asschers are an excellent look for many designs, but particularly square halos, art deco, and other vintage styles. Proportions and symmetry are critical for asschers. You want to ensure that, from above, the faceting produces a well-defined pattern of concentric squares. Similar to emerald cuts, asschers do little to hide inclusions, so we recommend VS clarity to ensure your diamond is eye clean. I+ color will ensure your diamond is free from any visible yellow tint. The pear is beloved for its striking shape: it’s traditionally worn point-out, but also can be worn point-in, or even set horizontally. 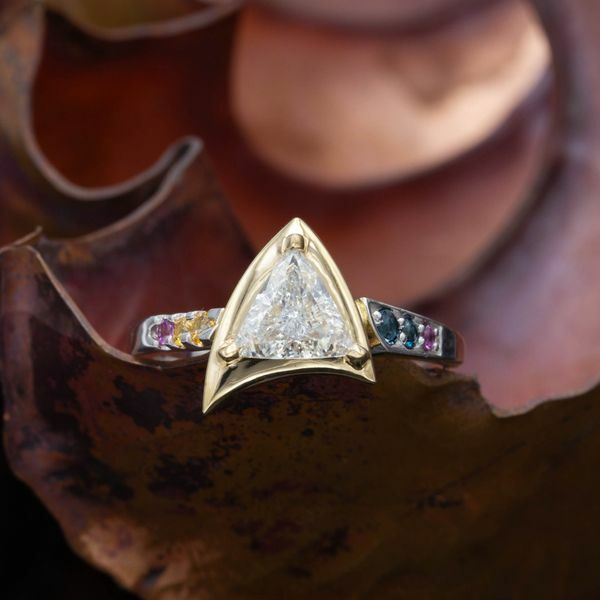 The teardrop shape incorporates features of both a round and a marquise. Pears feature a unique look that’s sure to stand out from the crowd. 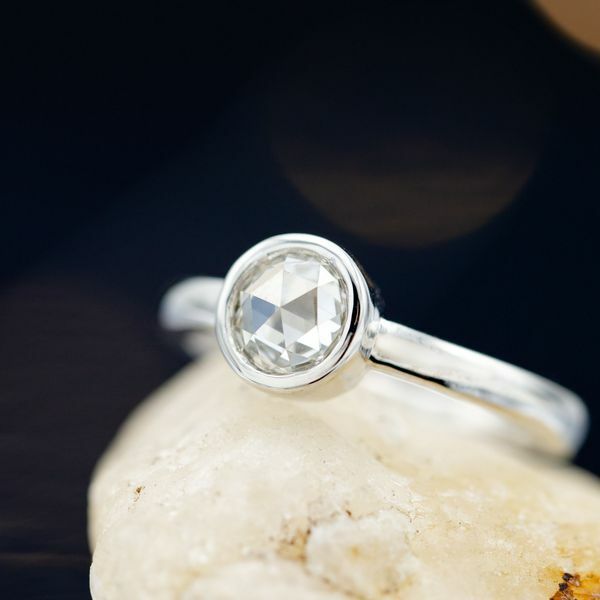 Well-cut stones feature sparkle similar to a round on the curved end that contrasts with a mesmerizing crushed ice look on the pointed end. 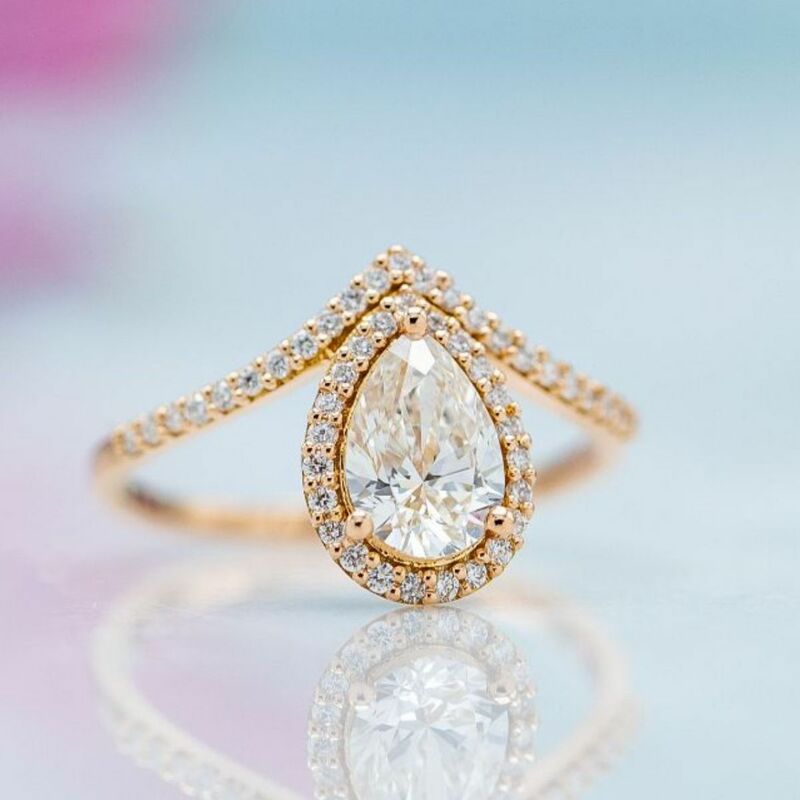 Like other elongated shapes, pear shape diamonds can lend a slimming look to the wearer’s finger. Well-cut pear shapes are hard to find. There are lots of factors to check from the curve of the shoulders to the overall symmetry to the extent of the bowtie effect. There’s disagreement among diamond experts on what length-to-width ratio is ideal — we recommend anything from 1.40 - 1.70 depending on your preference. Pears hide inclusions well, so we recommend SI clarity for the best value. The overlapping reflection of light that causes the crushed ice effect on the pointed end also pools color tint so we recommend sticking to H+ color in white gold or platinum settings. A distinctive vintage style, the original marquise cut was developed under unusual circumstances. It was commissioned in the 1700s by King Louis XV of France to match the lips of his mistress Jean Antoinette Poisson. Its long narrow shape can look quite large relative to its carat weight. The elongated look of the marquise lends a slimming appearance to the wearer’s fingers. Their length also makes them fit nicely with complementary side stones and curving, vintage designs. Since marquise diamonds appear large, they can be a way to make a bold statement. Symmetry is crucial for an even and balanced appearance — you should be able to draw a line from one point to the other that goes straight through the center. We recommend a length-to-width ratio of 1.70-2.15 for the signature elongated look of a marquise. Similar to other long shapes, the stone should be inspected via 360 video to ensure there is no distracting bowtie effect. We recommend H+ color and SI+ clarity. A modern design developed in the 1970s, radiant cut diamonds bring a brilliant facet pattern to the rectangular shape of an emerald cut. Radiant cuts combine the defined edges of an emerald cut with the sparkle of a a brilliant cut. They’re great for customers that want the brilliance and effective light-return of modern cutting techniques in a rectangular shape. They also feature the coveted crushed-ice look, lots of tiny shimmering sparkles of light that look like crushed ice when viewed from above. Length to width ratios range from square to rectangular based on your preference. We recommend browsing a few shapes to see what you like best. Similar to cushions, radiants can pool color tinge, so we recommend sticking to H+ color. The scintillation radiants are known for means they are excellent at hiding inclusions. Eye-clean options can be found at SI clarity. The heart — a shape unmistakably associated with love, you don’t have to be a genius to see the power of the symbolism here. Is your significant other a hopeless romantic? Does she love pink, doodling love poems, and the 😍 emoji? Ok, these are stereotypes, but the folks that love heart shapes tend to be a bit stereotypical (and they know it!). This shape is the perfect choice for the girl (or in some cases, guy!) who wants to wear her heart on her sleeve (ok, finger). 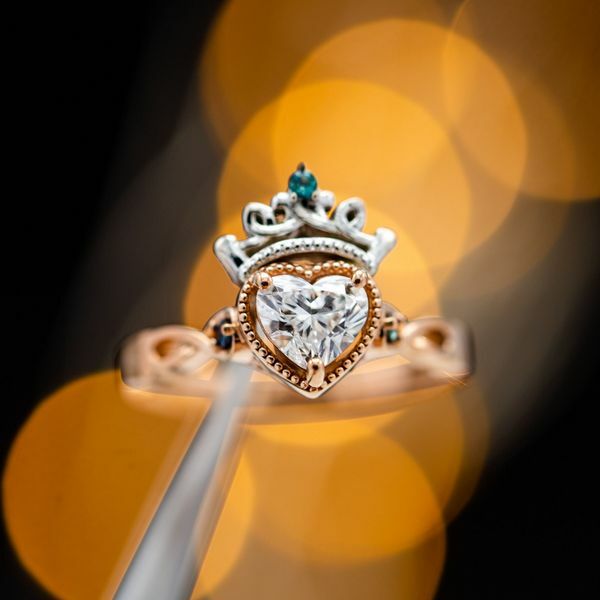 It's also a popular choice for a Claddagh-inspired ring design. Be picky, it’s hard to find well-proportioned heart shapes. You need even lobes, a distinct cleft, and a clear point at the bottom. Length-to-width ratios should stay above 0.90, with closer to 1.00 being ideal. Hearts look best in larger carat sizes where the shape is well-defined and not overwhelmed by prongs. We recommend H+ color and SI+ clarity. 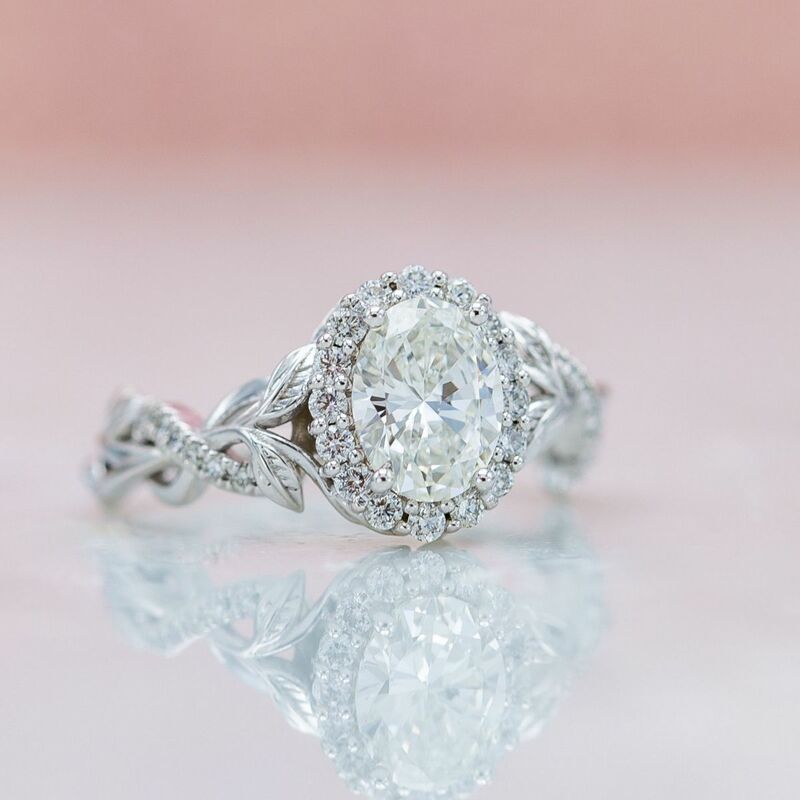 This glassy, unique, vintage cut has come back in a big way. 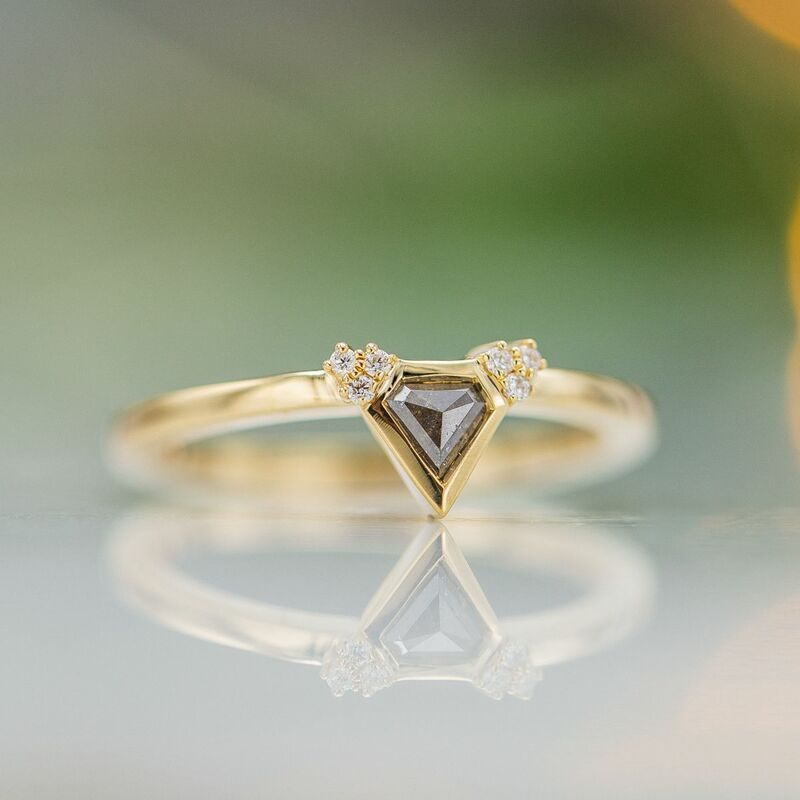 Based on a technique that dates back to the early days of diamond cutting, rose cuts consist of a flat (or close to flat) bottom and a domed top with triangular facets. They are primarily rounds, but also seen in oval or elongated shapes. The most vintage and understated option available, rose cuts present something truly unique: a look from another era. They have limited sparkle and instead feature an ethereal glassy look. When viewed from above, their triangular facets form into pretty geometrical patterns. Their flat shape also yields two unique benefits: they will look quite large for their weight and they can be set close to the finger for a low profile setting (even with a larger diamond). Traditional advice goes out the window with rose cuts, since we’re optimizing for vintage appeal, rather than flawlessness, colorlessness, and light return. Fans of older stones often like a bit of warm color, inclusions, or uneven faceting, all of which are common in genuine vintage diamonds. Options are more limited, so we recommend making sure that you can see high-quality images to help you hunt down the stone of your dreams. Also referred to as trilliant diamonds, trillions are among the more unique shape options. Their geometric beauty makes for a bold choice. They tend to look larger than diamonds of similar carat weight because they are cut shallow — typically from thin, flat pieces of diamond rough called macle. This three-sided stone makes for a choice that will stand out in a crowd. It also evokes deep symbolism from books, films, TV, and games. That’s right, trillions can be a particularly good choice for fans of Zelda (think Triforce), Star Trek (check out the example above! ), or Harry Potter (Deathly Hallows, anyone?). In addition, trillions face up looking larger than their carat weight because of their shallow cut. Trillions are rare compared to other shapes, so consider a slightly wider range of sizes in order to find your perfect match. Since trillions are shallow, they have less brilliance than most other shapes. The presence of dust or oil can reduce brilliance and accentuate imperfections, so it’s important to have a setting that allows you to clean the stone regularly. In addition to the shapes and cuts we’ve discussed above, you might hear terms like Old Mine Cut and Old European Cut. 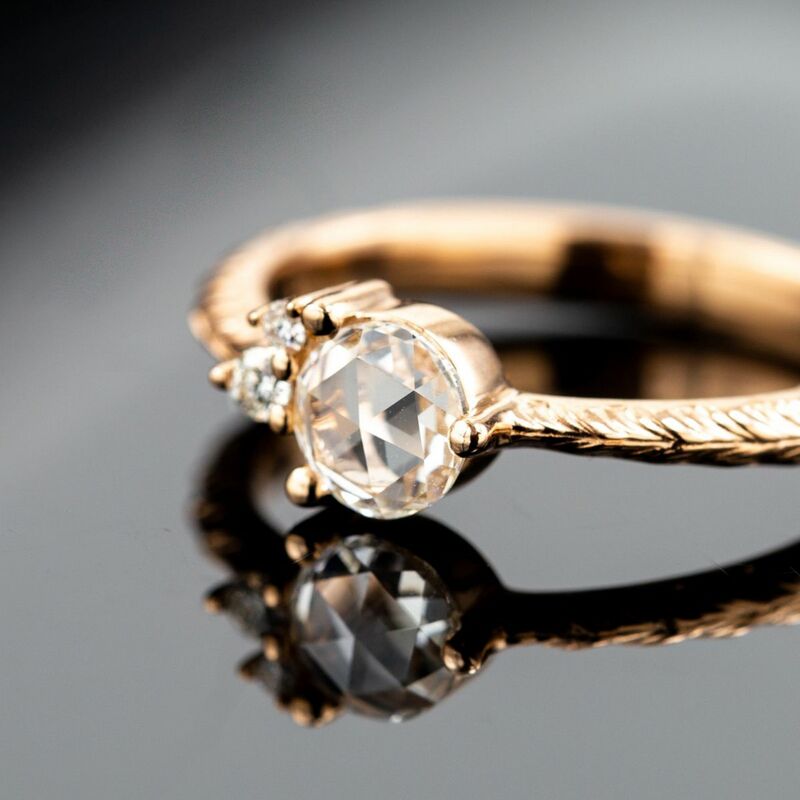 In addition to Rose Cut (which we’ve covered in more detail), these all reference different vintage cuts used since the start of diamond cutting in the 1500s up to the mid 1900s where modern cuts became the norm. Both Old Mine Cut and Old European Cut are precursors to the modern Round Brilliant Cut. Old Mine cuts are the older style, developed in the 1700s. Affectionately referred to as “old miners”, they come in a soft square shape that resembles a rounded version of modern cushions and features a variety of facet patterns. Some are rounded so that they look nearly circular. They feature small tables, high crowns, and large culets — all features that are different from modern brilliant cuts, making them stand out with a vintage style. Old European Cut diamonds represent the transition step between Old Mine Cuts and modern round brilliants. They have 58 facets, like the modern round brilliant, but in different proportions. Similar to the structure of old miners, old euros feature taller crowns, smaller tables, and larger culets. They have a subtler, vintage look when compared to the brilliance of modern cuts. 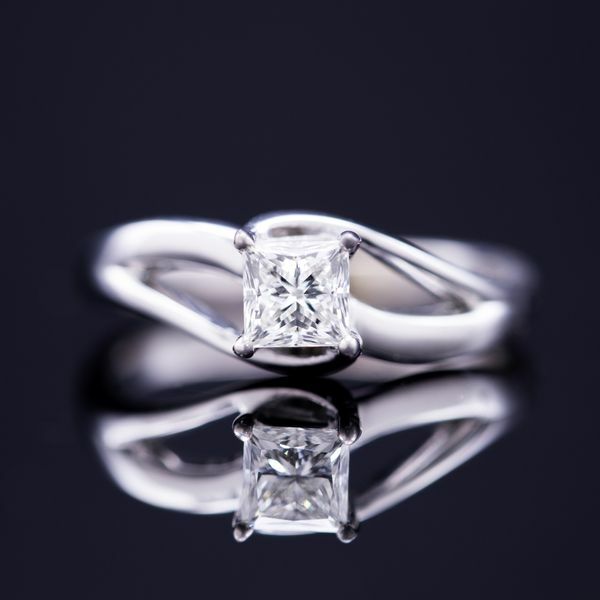 They also tend to be taller and narrower than modern cuts, so face up smaller relative to their carat weight. For customers that are interested, vintage cuts are available through specialized sourcing. 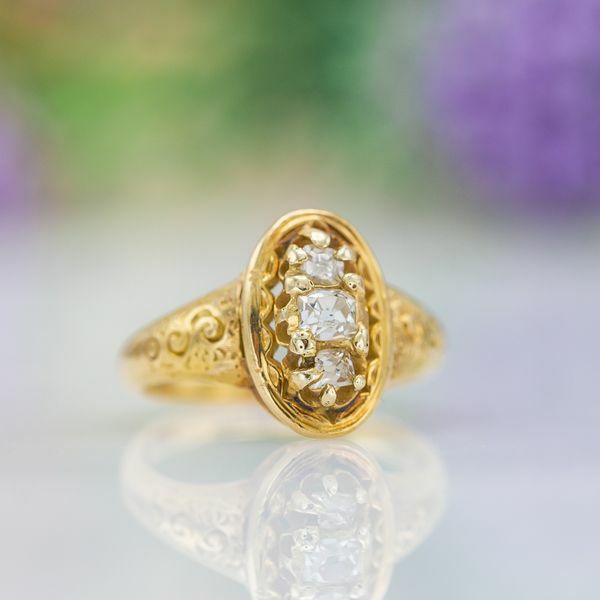 Unlike searching for a modern round brilliant, where you can specify all of your parameters in advance, finding a vintage stone is more like a treasure hunt. There are awesome options, but you start with what’s available, rather than narrowing your parameters first. This overview covers all the common cuts for diamond center stones, but it’s worth noting that other options do exist. Baguettes are a common choice for side stones and have featured in famous eternity bands for Marilyn Monroe and Queen Letizia of Spain. Kite, shield, and half moon cuts draw inspiration from other objects. Hexagon, pentagon, and octagon shapes can feature either step or brilliant cuts. 99% of customers will stick with something we mentioned above, but we just thought it worth noting that there are other styles. Flanders, Briolette, calf, bullet, lozenge….ok, ok, we’ll stop. We’ve chosen to focus this article on diamonds, but cut and shape also play an important role for colored gemstones. Cut quality is typically not assessed as closely is it is for diamonds because the primary determinant of quality is the color of the stone. Cut and shape are important but play a secondary role. 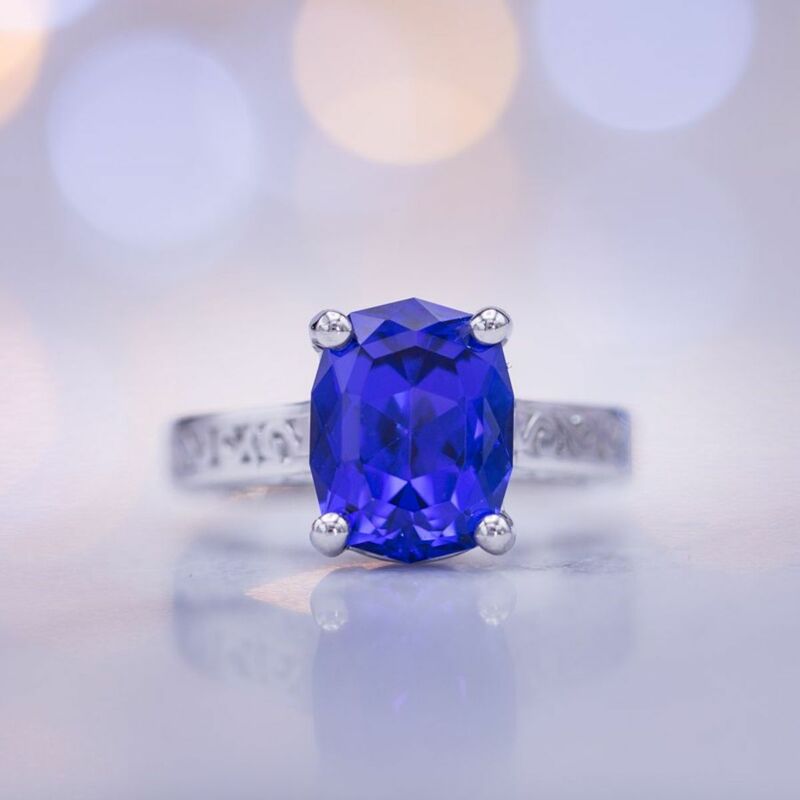 Since light performance is less critical, in larger carat weights you’re most likely to find cuts that both show color well and retain lots of carat weight from the rough. 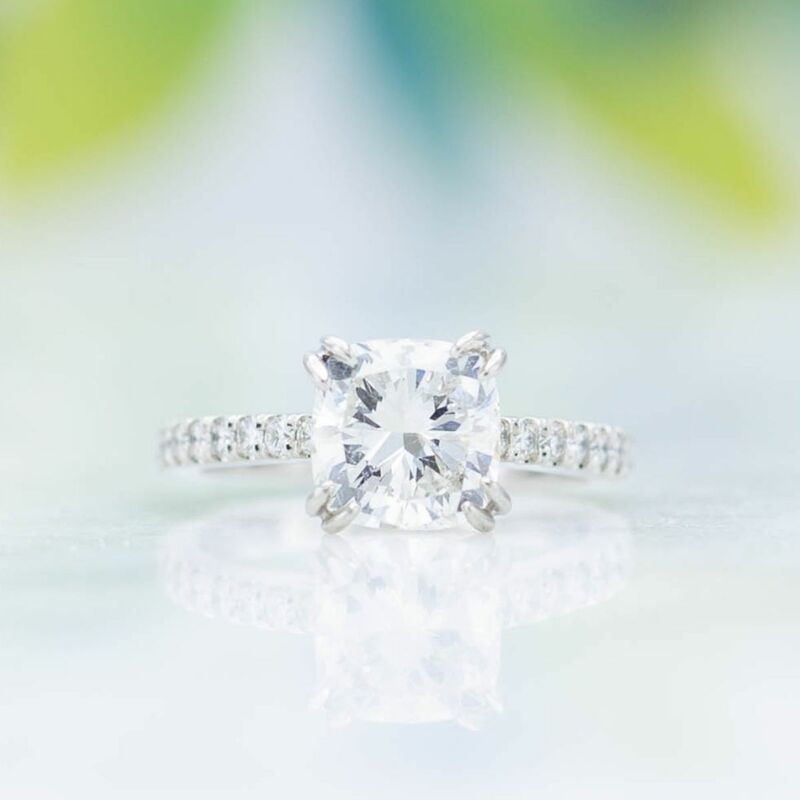 Ovals, Cushions, and Emerald cuts are common. Rounds, ubiquitous in diamonds, aren’t as popular in higher value color. Anyways, there's lots more to learn about color, but this isn't the place to cover it. If you want to learn more, reach out to our design team and ask us! We hope this article has given you a solid understanding of the different diamond shapes and cut types available. 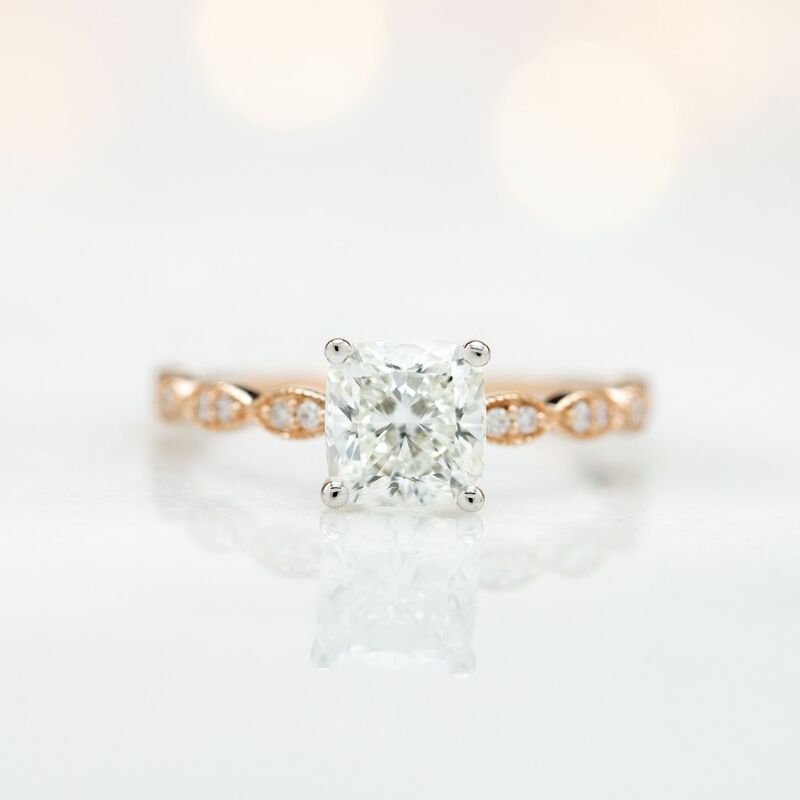 There's plenty more depth to each shape, but don't worry, our we'll talk you through all of the selection nuances in detail when it comes time to pick out your diamond. Also, you are now free to refer to terms like oval and emerald cut as shapes, cuts, types, or whatever makes the most sense to you. We tend to use shape as a catch-all term to refer to either just shape (e.g. oval) or a combination of cut and shape (e.g. emerald), but there isn't an ideal answer. So... go wild! We'll know what you mean. 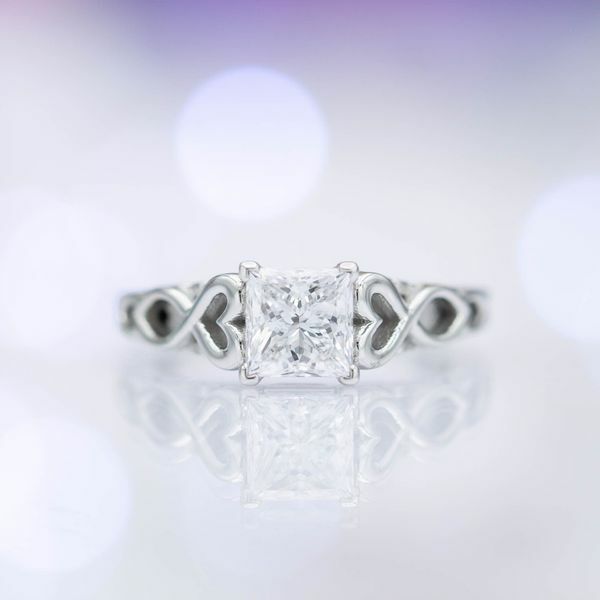 CustomMade designs and creates one-of-a-kind, custom engagement rings and fine jewelry. Each piece we create is inspired by you, designed for you, and made just for you. See our reviews. Read our FAQ.